Oops! In a rush shopping job, I bought my cranberries at Costco and when it came time to unpack my groceries at home I realized that the bags was a giant 2 pounds! That's a lot of cranberries. In case you also have a few cranberries too many, here are a few delightful holiday recipes for cranberries. Bring cranberries, wine, juice, zest, sugar, salt to a boil in a 2-quart heavy saucepan, stirring occasionally, then reduce heat and simmer 5 minutes. Add more sugar, to taste (up to about 2 1/2 tablespoons). Stir in persimmons. Refrigerate. Serve at room temperature or slightly chilled. Make cranberries up to four days in advance. Add persimmons before serving. And if you want to try a delicious twist, why not play on the sharp flavors in cranberries by adding sour cream and horseradish? Not only great with Thanksgiving dinner, this version makes a fantastic accompaniment to leftover turkey sandwiches. Blender— Put all the ingredients in a blender and blend until just combined. Freeze— Put the mixture in a freezer-proof container and freeze overnight. 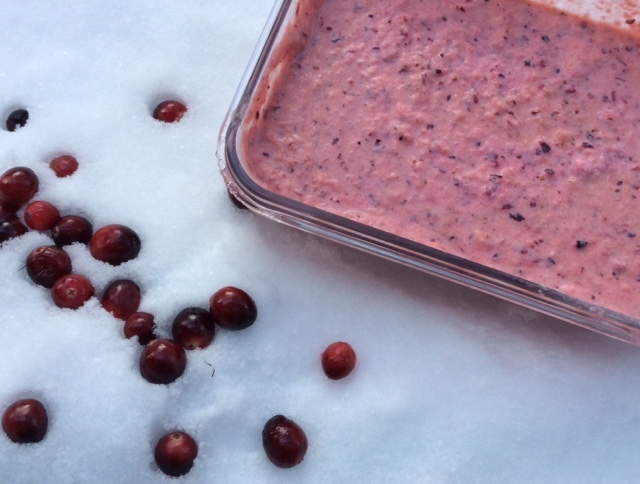 Thaw and serve-- Thaw the cranberry sauce in the refrigerator and serve. Preheat the oven to 350 degrees and spary a 9 x 5 loaf pan with coconut oil. Dry ingredients—In a mixing bowl, combine together flour, baking soda, baking powder, salt, coconut sugar and grated rind. Wet ingredients-- Make a well in the center of the dry ingredients and add in the butter, coconut nectar, orange juice and egg. Stir ingredients together until just combined. Nuts and fruits-- Stir in cranberries and pecans. Bake—Pour ingredients into baking pan and bake in the oven for 55 minutes or until a toothpick inserted into the middle comes out clean. Cool and serve.